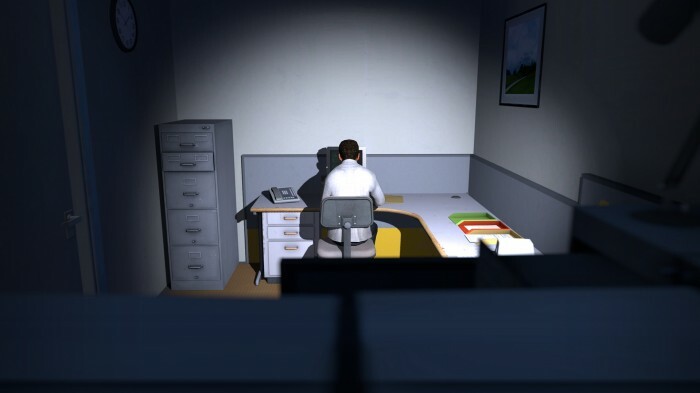 It’s quite hard to describe what The Stanley Parable actually is. I’d say it’s a narrative first person game. But It’s not a narrative first person game such as ‘Dear Esther‘ where you basically follow a mostly linear path and experience a story. The Stanley Parable is about choice and self-determination. I will try to not spoil you anything in this review, in fact I suggest that you try out their demo right now. It’s about 30 minutes long and the story is entirely different from the actual game. But the demo gives you a glimpse about the feel of the game. If you don’t like the demo you won’t like the game. It’s as simple as that. If you however do like the demo, you maybe want to skip this (and all other) reviews entirely and first experience the game yourself. Believe me, the less you know the better. You are playing as Stanley who is working in an office and is pressing whatever button his computer tells him to. One day the computer suddenly stops giving him any more commands and now it is up to you to find out what happened. Or didn’t happen. Or maybe you don’t even want to do that and just wait for your computer until it starts giving you commands? The music in the Stanley Parable suits the game well, but it’s not something you’d want to listen to when you are not playing the game. Which is perfectly fine if you ask me. The voice acting is extraordinary though! The game has a narrator which pretty much … you know what? Screw this, whatever I write here will spoil the game to you and if you have no intent of playing this game by yourself you could also start watching the different endings in my guide section. For everyone else: STOP READING AND START PLAYING! A one of a kind experience you shouldn't pass on.